I was going to put in many good words for Annie at the meeting. I’ve known her for a few years now, ever since she got one of my “impossible” chemically sensitive patients dramatically better. He found out about her program and went himself. Since then I’ve sent her several more of my most difficult patients, and she’s had a few workshops in Santa Fe. I’ve long felt very strongly that there is a fine line dividing patients I can get better with LDA [ultra low dose enzyme enhanced immunotherapy], and those who will NOT get better, almost no matter what. Annie Hopper’s program, which addresses the limbic system “engrained memory” aspect of MCS and many other conditions, is the only way I’ve found for some patients to get out of their illnesses. Physical treatment is often just not enough. 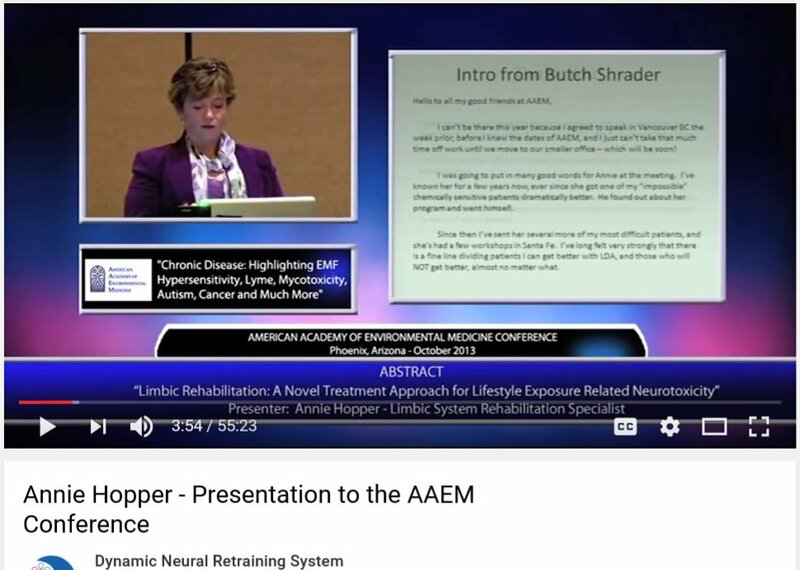 Some of you old-timers will recall Dr. Ken Gerdes’ talk about his MCS patients he always treated only in conjunction with a psychologist, and perhaps even Dr. Jackie Krohn’s talk about a history of abuse in many of these patients. These talks struck a chord with me, and Annie has found a way to deal with many of the patients like this. The DNRS website doesn’t say anything about which people are more likely to benefit. However, if you apply to go to a seminar you will be interviewed and based on that they will decide whether or not you can attend. They don’t say what they are looking for.